Imagine how revitalised you’d feel waking up to vast sea views and big open skies each and every day. Perched on a lush wooded hillside, overlooking the North Devon coast, Bideford Bay feels so far removed from hectic day-to-day life. With beaches close by, your lodge-style home makes the perfect escape for two or a full family getaway. And it features comfortable furnishings and stylish fittings to make your year-round coastal retreat effortlessly easy to enjoy. Make precious new memories with loved ones, and take time just for yourself – to unwind and enjoy the simpler things. Enjoy some much-needed downtime in your snug lodge, or head out and explore the coast. Bideford Bay serves up so many possibilities. Golden sands are just a short drive away. Perfect for long walks and the best beach days. Devon’s Hartland Heritage Coast is on the doorstep, with its stunning coastal walks and historic sites like Clovelly. 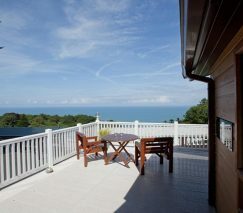 Epic sea views and a quiet cliffside setting make Bideford Bay feel wonderfully tranquil. Heated indoor and outdoor pools, crazy golf, an adventure playground… enjoy first rate-facilities on-site.